If your automotive service department is serious about customer satisfaction, you'll be sure to use auto paper floor mats during each and every repair. 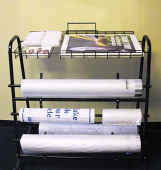 Estampe carries several kinds of heavy-duty auto paper floor mats. Disposable floor mates also come as poly-backed, latex-backed, plastic and in a new styles called waffle mats. These Full Adhesive Floor Mats protect new or freshly cleaned automotive carpets. It's used widely by auto repair shops, detailers and dealerships. These floor mats are perfect for used car dealerships to demonstrate to your customer that you have deep-cleaned and detailed the car thoroughly. Plus, these won't slide around like paper floor mats. Each is printed with "Dealer must remove" and available in two thicknesses. 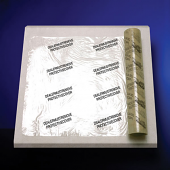 These mats have the highest available adhesion and are perforated for easy handling and application. If you are serious about premium automotive customer service, you'll use these Waffle Design Paper Floor Mats. Made of heavy-duty, super absorbent paper and coated on the back, these paper floor mats are perfect for use when the weather is bad. The waffle design holds dirt and water. Plus, waffling helps to keep the mat in place and from sliding around on the floor of the car. These mats are like a disposable-paper version of the popular waterhog mat. These Disposable Automotive Latex Floor Mats are durable floor mats made of latex-impregnated 80# paper. The best choice for standing up to wet conditions and winter weather.